“And the LORD spake . . . saying . 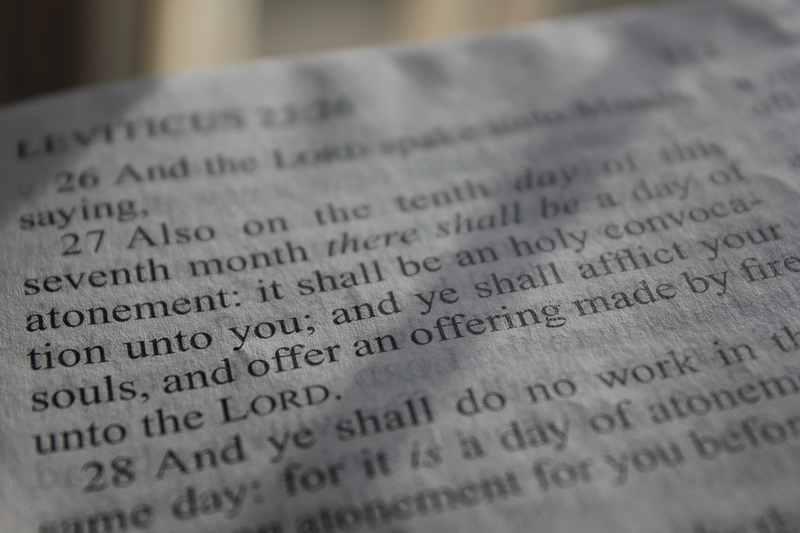 . . also on the tenth day of this seventh month there shall be a Day of Atonement: it shall be an holy convocation unto you; and ye shall afflict your souls [fast] . . . Ye shall do no manner of work: it shall be a statute for ever throughout your generations in all your dwellings. It shall be a Sabbath of rest, and ye shall afflict your souls: in the ninth day of the month at even, from even to even, shall ye celebrate your Sabbath” (Lev. 23:26-32). The text “from even unto even shall ye celebrate your Sabbath” (Lev. 23:32) is often quoted by Sabbath-keepers to show that the Sabbath begins at sunset. Obviously, it would be wise then, to keep the very Sabbath this text refers to— the Annual High Sabbath—the Day of Atonement—which is instituted forever! Let us be consistent with the Word of God. Let us be consistent about what the Word of God does command. ”Afflict,” is from the Hebrew word which also means to humble oneself. It is understood to mean fast, to go without food and drink for a proscribed period of time—and for a specific purpose (Acts 27:9). Consider again how different, how unique this day is. No feasting. No rejoicing. Indeed, everything just the opposite to the extreme—we are to afflict our souls. “…whatsoever soul it be that shall not be afflicted in that same day, he shall be cut off from among his people. And whatsoever soul it be that doeth any work in that same day the same soul will I destroy from among his people….it shall be a statute for ever throughout your generations in all your dwellings” (Lev. 23:29-31). Why does God command us to afflict our souls on this High Sabbath of complete absolute sobriety and somber seriousness? What is the vital object lesson for us? As we seriously study God’s Word, we see that the theme of this day is one of separation. While it is sometimes referred to as “at-one-ment” (and, it is true that the final outcome of this day does allow us to be completely reconciled, completely at-one, with God), the theme actually is all about separation. Separation from our sins, and separation from the author of sin. The word Atonement itself is from the Hebrew “Kaphar,” meaning “to cover.” When we apply the shed blood of Christ, it covers and removes our sins. Even the slate or record of our sins is wiped clean. They are removed. There is no longer a valid record for the adversary to use to accuse us (Col. 2:14-15, Rev. 12:10). Even any record of our sins is utterly erased. We realize that we are separated from our sins by the Sacrifice of Christ, for He has removed them “as far as the east is from the west” (Psa. 103:12). And we shall be completely separated from the author of sin, the “god of this world” (2 Cor. 4:4); who is the evil one—whom Christ has nothing in common with (John 14:30) . . . and neither should we (Mat. 6:13, John 17:15). Of course, being separated from our sins—our sins being fully removed—is essential in order for us to be reconciled with God (Rom. 5:8-10, Col. 1:21-22). Realizing all that Christ has done for us, as embodied through the Passover (1 Cor. 11:25-26), shows us why this day is so serious. ”Thou art of purer eyes than to behold evil, and canst not look on iniquity” (Hab. 1:13). Christ became human in order to live and show a perfect life and to die for our sins (Rom. 5:6, 8; 8:34; 14:9, 15, 1 Cor. 8:11; 15:3). Christ died for humankind’s sins: “For since by man came death, by man came also the resurrection of the dead” (1 Cor. 15:21). We should always remember, never forget, the supreme price our Lord and Savior Jesus Christ paid in our place, for our sins. and with the “father of lies,” who has “no truth in him” (John 8:44). Vital symbolism is expressed through the account of the events of the Day of Atonement, in the 16th chapter of Leviticus. “And he [Aaron] shall take of the Congregation of the children of Israel two kids of the goats for a sin offering” (Lev. 16:5). The high priest first offered a complete sin offering for himself and his house (Lev. 16:6), so that he was then ceremonially able to acceptably officiate as the high priest for the people—representing our High Priest, Jesus Christ (Heb. 3:1; 4:14-16). “And he shall take the two goats, and present them before the Lord at the door of the tabernacle of the congregation. And Aaron shall cast lots upon the two goats; the one lot for the LORD, and the other lot for the scapegoat [Azazel]” (Lev. 16:7-8). Though this is straight-forward, it is seldom truly understood. There are copious views, opinions, ideas and explanations of this. As we have seen, it is quite common for erroneous concepts to be accepted without questioning them, without proving the truth. So then, objectively, without bias, let us prove all things, that we may fully understand and live the Truth (1 Th. 5:21). The word “Azazel” does not occur elsewhere in the Word of God, nor does this typology occur anywhere else in Scripture. The Comprehensive Commentary says “Spencer, after the oldest opinions of the Hebrews and Christians . . . Azazel is the name of the Devil, and so Rosen . . . The word scapegoat signifies the goat which went away.” The One Volume Commentary says: “The word ‘scapegoat’ in the A.V. is not a translation.” In other words it is just an interpretation of the supposed meaning. In English the word “scapegoat” signifies “one who bears blame or guilt for others.” But that is not a translation of the word Azazel. As Scripture shows, it is not an accurate understanding of the word which was inspired in the original Hebrew text. The One Volume Commentary goes on to state: “Azazel is understood to be the name of one of those malignant demons.” The Holliday Hebrew and Aramaic Lexicon says that Azazel is “a desert demon.” Harris’ Theological Wordbook notes that The LXX, Symmachus, Theodotian and the Vulgate have understood it to stand for the “goat that departs,” considering it to be derived from two Hebrew words: (for) “goat” and (for) “turn off” (i.e. turn out of the way). These two goats were, of course, types. Notice, it was necessary to be decided by lot, which one was qualified to represent Christ, and which to represent Azazel. Some say both were qualified. The Scripture does not say this. Let us not assume. Aaron could not simply decide which goat was qualified to represent Christ. This involved a sacred appeal to God to decide. ”One lot for the Eternal, and the other lot for Azazel.” The one lot that is for the Lord very clearly typifies Christ, our Savior. But the other lot was not for the Lord, not typifying Christ, but Azazel. Harris notes the preposition “to” is attached to Azazel. These words suggest that Azazel is the name of an entity, here contrasted to the Eternal. One for the Lord, the other for Azazel. Now the goat which God selected, through lot, to represent Christ, was slain—as Christ, its antitype, was slain; but the other goat selected by God to represent Azazel was not slain, but was driven, alive, into an uninhabited wilderness. It was not a resurrected goat, symbolizing the resurrected Christ, for it never died. The uninhabited wilderness, to which this goat was driven, cannot represent heaven, where Christ went. Heaven is neither uninhabited, nor a wilderness. After God designated which goat represented Christ, and which Azazel, the High Priest (Lev. 16:11) killed the bullock for a sin offering for himself, then took the burning coals of fire and the sweet incense into the Holy of Holies, also sprinkling the blood of the bullock before the Mercy Seat, typical of the throne of God, covering the tables of testimony (the Law). The goat which God selected by lot to represent Christ, as the sin offering of the people, was killed. Thus the sins of the people were borne by this goat, even as Christ, finally, once for all bore our sins on the cross. Our sins are removed by the blood of Christ. Then Christ rose again from the dead, ascending to the throne of God in heaven—and He will return to establish His Kingdom. So then, who, or what, from this point on in this Levitical ceremony, typified the resurrected Christ, who went to heaven? Some say the goat representing Azazel. But considering the types in the ceremony, does that even remotely make sense? The risen Christ is now at the right hand of the throne of God in Heaven (I Pet. 3:22). What is He called? Our High Priest! What was the earthly type of God’s throne? The uninhabited wilderness where the live goat went? Or was it behind the veil? The earthly type of God’s throne was the Mercy Seat in the Holy of Holies! After Christ died, He went to the heavenly mercy seat interceding for us, as our High Priest “. . . entering into what is within the veil; whither the forerunner is for us entered, even Jesus, made an high priest for ever after the order of Melchisedec” (Heb. 6:19-20). Of course, the one goat for the Lord that had been slain, represented the slain Christ. The risen Christ is now our High Priest. So, who took this part in these Levitical ceremonies, temporarily re-enacted year by year, on this sacred Annual Sabbath? Of course, it was the Levitical High Priest who is the type of our High Priest—not the goat representing Azazel! The high priest, annually, on the Day of Atonement, performed sacred duties the Israelites considered the most vital of the year! As Christian Firstfruits, how vital is it to have Christ—our intercessor—inside the veil of the holy throne of God in Heaven? For nearly 2,000 years, He has been there, making intercession for the saints, the Firstfruits of God (Rom. 8:34, Heb. 7:25)! As soon as the slain goat was dead, who went within the veil presenting the blood of this goat before the typical throne of God? “Then shall he (the high priest) kill the goat of the sin offering, that is for the people, and (now the high priest himself typifying the work of the risen Christ) bring his blood within the veil . . . and sprinkle it upon the Mercy Seat: and he shall make an atonement for the holy place” (Lev. 16:15-16). It was the high priest taking the blood within the veil to the mercy seat that typified the risen Christ (figuratively taking His blood, once for all, within the veil to the very throne of God in heaven, there to intercede for us as High Priest). Surely this is so plain that even a child can see it. The slain goat represented the crucified Jesus. The High Priest, by taking the blood of this slain goat into the veil to the mercy seat in the Holy of Holies, a type of God’s throne, represented the work of the risen Christ, who ascended to the right hand of the Majesty on High, there interceding as our High Priest. How can supposed theologians continue to teach that the goat representing Azazel represented the work of the Risen Christ? Did this live goat take the blood of Christ within the veil, to the mercy seat? The high priest going within the veil, into the Holy of Holies, symbolized Christ’s return to heaven. The work he did while in the Holy of Holies symbolized Christ’s work these nearly 2,000 years—interceding for us, presenting His shed blood before the mercy seat in heaven. Now, as we return to the Scripture, now symbolizing Christ’s return to earth (Lev. 16:20), what did the priest do at this point? “And when he hath made an end of reconciling the holy place, and the tabernacle of the congregation, and the altar, he shall bring the live goat: and Aaron shall lay both his hands upon the head of the live goat, and confess over him all the iniquities of the children of Israel, and all their transgressions in all their sins, putting them on the head of the live goat, and shall send him away by the hand of a fit man into the wilderness: and the goat shall bear upon him (ESV, NAS, NIV, NKJ: “shall bear on itself”) all their iniquities unto a land not enhabited: and he shall let go the goat in the wilderness” (Lev. 16:20-22). “And Aaron shall . . . wash his flesh with water . . . and he that let go the goat for the scapegoat (Azazel) shall wash his clothes, and bathe his flesh in water, and afterward come into the camp” (Lev. 16:23-26). We should carefully consider that it is immediately after laying hands on the live goat (Lev. 16:21-22) the High Priest must wash “with water in the holy place” (Lev. 16:23), and he that let go the goat “shall wash his clothes, and bathe his flesh in water, and afterward come into the camp” (Lev. 23:16). Clearly this is indicative of having handled something that is unclean. As with so many Truths in Scripture, it is so important, so vital, to get things right. There are so often “misconceptions,” “misunderstandings,” that in reality are the very thing we have been learning about—lies promulgated by the adversary! Consider the nature of the intently misrepresented Words of God, from when Satan used Scripture to tempt Christ (Mat. 4:6), to the countless times he plants heresy in an effort to pollute God’s Truth (1 Cor. 11:3, Eph. 2:2, 1 Jo. 5:18-19, 2 Jo. 1;6-7). Not only is he a murderer from the beginning, but he did not abide in the truth—because there is no truth in him (John 8:44). “for he is a liar, and the father of it” (John 8:44). Jesus took our guilt—our blame—our sins—upon Himself as an innocent substitutionary sacrifice. He was an innocent victim. He loved us, and was willing to die for us. Our guilt—our sins, were borne by Him, and Him alone. God forgives us of our sins when we repent and accept the Sacrifice and the blood shed in our place through His son Christ Jesus. Christ became human to die for our sins (Phil. 2:7-8, Rev. 13:8). Yet if that is all there is to it—has all sin really fully been dealt with? Has sin, all sin, truly been removed from God’s holy presence? The real cause—the actual author of sin—is Satan the Devil. Would it be right for Christ to bear our guilt, guilt that is not His, while the Devil has no consequence for bringing sin into existence? Or would justice demand that God’s great Plan finally place the original blame and guilt right back where it belongs? Christ bore our guilt. We have been guilty, though the Devil is the original cause, the originator, the author, of all such evil. For human beings—created mortal—with death as the penalty for our sins (Rom. 5:12, 1 Co. 15:21): our Creator, who’s life is of greater value than all of creation, can pay the penalty for our sins. This fully meets the holy righteous requirement of God. But what about angels? What about beings that were not created mortal, but were created as spirit beings—not subject to death? What does the holy requirement for true justice call for in a case where an immortal being is in complete rebellion? If an immortal being chooses to not repent, or reaches a point of being unable to repent—only willing or able to continue in defiance against God—what is the inevitable end? With no chance of reconciliation, what can be done? True justice would certainly demand that—sins, infused into the human realm, upon weaker unsuspecting beings—would be placed right back on the head of the author or originator of those sins! The devil bears his own guilt: not our guilt, but his own guilt, for promulgating his sins and his evil rebellion on the human race. We were guilty too—and Christ died for our guilt, our own sins—yet those same sins first originated from another source. Those original sins, which Christ did not die for, belong back on the head of the adversary, the originator, as his own guilt! The Azazel goat carries away the sins of all the people already forgiven. These sins already were fully paid for by Christ’s substitute sacrifice, symbolized by the killing of the innocent goat—before those same sins were finally laid on the living goat! The Devil is the real author of all sin. Can we truly have peace, as long as this instigator of sin is with us? Is it not evident he must first be driven away? True justice requires Satan’s own guilt, his part in our sins, be placed back on his own head. Christ did not die to bear the devil’s guilt. He died to bear our guilt. He died for our sins. Christ has borne our sins— but should He continue to carry any vestige of them? Should not they be entirely removed from us and the presence of God? The killing and sprinkling of the blood of the first goat visibly set forth the means of reconciliation with God, through the substitute sacrifice of the worthy innocent victim—Jesus Christ, our perfect sinless Savior who died to atone for our sins. The final sending away of the second goat, laden with those sins, typifies the complete removal of those original sins from the presence of God, by removing the author of those sins—Satan, the devil; now also laden with his own sins, to carry them away. Satan is the accuser of the brethren. His power over men is founded on sin. When all of these sins, of which he is the author, are laid back on him (after being removed from us by Christ), Satan will have lost his claim on us. No longer can he accuse us! As the acceptance of the blood of the first goat (Christ) symbolized the complete propitiation and pardon of Israel’s sins; so the removal of Azazel, bearing those expiated sins away on his own head symbolizes the complete removal of all sins! We are completely delivered by The Atonement from the Power of the Adversary. The sacrifice of the first innocent victim was the only means of reconciliation with God—but not yet complete justice. The driving away of the second live goat shows final atonement, by placing the sins on their author where they belong, and complete removal of sin from the presence of God and His people—and thus complete deliverance from the power of Satan. Webster says that ‘to atone’ means to set at one—to join in one—to form by uniting. We will eternally be joined as one—perfectly united with God—when this is finalized. After laying both his hands on the live goat, Azazel, Aaron had to wash and cleanse himself before coming in contact with the people. The fit man also had to wash his clothes and bathe himself after coming in contact with the Azazel goat before he came into the presence of the people. The symbolism is of having come in contact with the unclean Devil (Rev. 20:1-3). This act of putting these already expiated and forgiven sins on the head of this live goat does not take place until after the high priest returns from the Holy of Holies within the veil—typifying an act to occur after the second coming of Christ! The first goat represented the innocent Jesus who died for our sins. The high priest represented the risen Christ going within the veil to the mercy seat, the throne of God in heaven (near 2,000 years now). The high priest returning to place the sins upon the head of the live goat—represented the return of Christ, placing the all sins on their author, the Devil; who will then be sent away alive into a desolate uninhabited wilderness—which represents the bottomless pit or abyss of Rev. 20:3. Rev. 19 starts the second coming of Christ. By Rev. 20 what is to happen? Exactly what Lev. 16 shows. The Devil is sent away. The bottomless pit is the ”uninhabited desolate wilderness” (Rev. 20:2-3). He is sent there by a fit man—an angel of heaven. Note: Satan the Devil is not killed. He does not die. He is still alive a thousand years later—after the millennium (Rev. 20:7). Both goats were “presented before the Lord.” Job 1:6 and 2:1 says that he has presented himself before the Lord. But note that now Azazel is driven away from the Holy of Holies—the symbol of Gods presence. Satan is removed from God’s presence. This annual Day of Atonement is instituted forever to continually remind God’s children and His Church of the full Plan of Redemption, including these profound and essential events which will be finally fulfilled after the second coming of Christ. God completely forgives us of our sins. And He will completely expiate and remove those sins upon Christ’s return. “Humble yourselves therefore under the mighty hand of God, that he may exalt you in due time: Casting all your care upon him; for he careth for you. Be sober, be vigilant; because your adversary the devil, as a roaring lion, walketh about, seeking whom he may devour: Whom resist stedfast in the faith, knowing that the same afflictions are accomplished in your brethren that are in the world” (1 Pet. 5:6-9). “God resisteth the proud, but giveth grace unto the humble. Submit yourselves therefore to God. Resist the devil, and he will flee from you. Draw nigh to God, and he will draw nigh to you. Cleanse your hands, ye sinners; and purify your hearts, ye double minded. Be afflicted, and mourn, and weep: let your laughter be turned to mourning, and your joy to heaviness. Humble yourselves in the sight of the Lord, and he shall lift you up” (James 4:6-10). “Moreover when ye fast, be not, as the hypocrites, of a sad countenance: for they disfigure their faces, that they may appear unto men to fast. Verily I say unto you, They have their reward. But thou, when thou fastest, anoint thine head, and wash thy face; That thou appear not unto men to fast, but unto thy Father which is in secret: and thy Father, which seeth in secret, shall reward thee openly” (Mat. 6:16-18). “Having therefore these promises, dearly beloved, let us cleanse ourselves from all filthiness of the flesh and spirit, perfecting holiness in the fear of God” (2 Cor. 7:1). “How much more shall the blood of Christ, who through the eternal Spirit offered himself without spot to God, purge your conscience from dead works to serve the living God?” (Heb. 9:14). Let us therefore be very sober and serious, rightly afflicting ourselves that we will have nothing in common with the adversary; and so that we may be thoroughly purged of our sins upon the second coming of Christ—when He will set all things right— when He will place all sin (even the originator of sin, and his plethora of original sinful rebellion) right where it truly belongs.